People of Earth! We’ve received some important news from beyond the cosmos: The Countdown 2018 lineup is here, and it’s out of this world! Get ready to close out this epic year with a bang at our 5th annual New Year’s Eve bash, returning to SoCal Monday, December 31, at NOS Events Center in San Bernardino, CA. 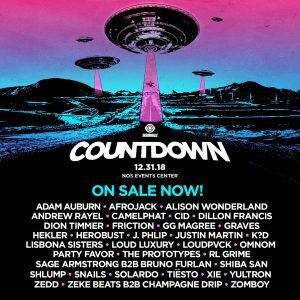 For more info, visit the Countdown NYE Website!